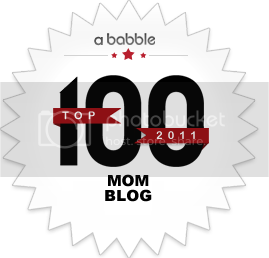 Editor´s note: We are thrilled to announce that Roxana and I are now one of 25 mom bloggers who have been invited to be a PBS KIDS VIP. As such, we will continue to share with you, just like we have in the past three years, all that we love about PBS KIDS in their various platforms. This also allows us to give the PBS folks more of your direct feedback and requests. So, feel free to reach out to us. Rest assured we are continuing to advocate for more and more bilingual and cultural content. 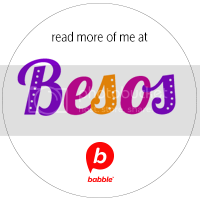 We´re always bilingual moms on a mission! PBS is celebrating Dr. Seuss’ 108th birthday on Friday, March 2nd with a The Cat in the Hat-A-Thon on-air, online, and on mobile and we want you all to join in on the fun! This means our niños get to enjoy two whole hours of back-to-back The Cat in the Hat Knows All About That-a PBS Kids series which has ranked among the top ten programs for children ages 2 to 5 since it premiered in September 2010-and also engage online and on mobile with the Cat and friends. I know what you’re thinking-that’s a lot of TV! But fear not, The Cat In the Hat Knows All About That is designed to help our kids build S-T-E-M (science, technology, engineering and math) skills that allow our children to be prepared for success in school. The marathon features four episodes in total, with two of them new: “Seasons – Spring and Summer/Fall and Winter” and “When I Grow Up/Doing It Differently.” After watching the copies we got to preview, my girl now can´t stop telling me all the things she wants to be when she grows up, totally letting her imagination soar. Video clips from all four episodes featured during the marathon will be available online and on the PBS Kids Video App for iPhone, iPad and iPod Touch. 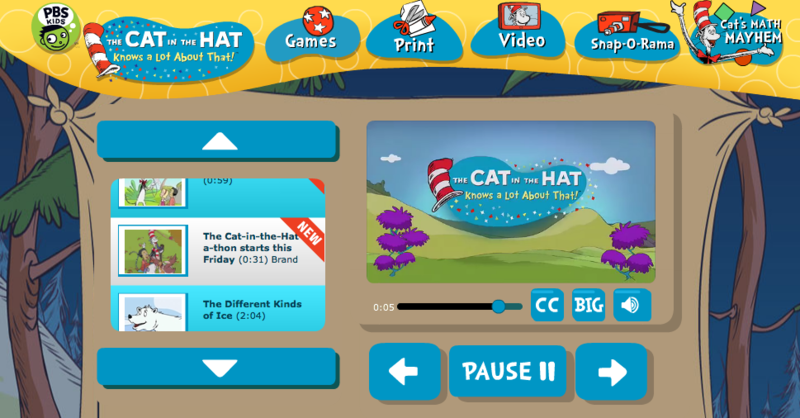 Also, educational The Cat In The Hat games are already available online here. We´ve had so much fun with the picture puzzles! PBS KIDS is hosting a Twitter Party on Thursday, March 1 from 9 -10 p.m. ET with Random House. You are all invited to join the fun with the hashtag #cithathon. 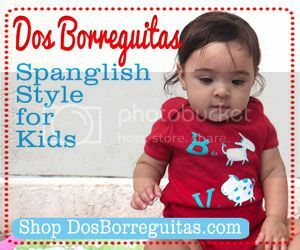 We´ll be there, so make sure you´re following us @SpanglishBaby and all the PBS KIDS VIP Ambassadors. This giveaway is now closed. Congratulations to the winners: Nancy and Deanna ! We’re giving away a gift bundle with a $25 gift card to the PBS KIDS Shop, the 3-D book Chasing Rainbows, courtesy of Random House and a DVD from the series, courtesy of NCircle Entertainment , for TWO lucky winners. Note that the DVD comes with a Spanish language option! To enter all you have to do is tell us which is your favorite The Cat In The Hat Knows All About That character. 2. Follow us on Twitter and tweet about this giveaway including a link to the post , @SpanglishBaby and the #CITHathon hashtag. Copy the link to the tweet in an additional comment on the giveaway’s post. This giveaway ends Tuesday, March 6th at midnight PST and is open to everyone over 18 years of age in the continental U.S. Void where prohibited. No purchase necessary. Check out the Giveaway Rules. Disclosure: As a PBS KIDS VIP Ambassador no compensation was received for this post, other than the same prize bundle we are giving away. Our favorite character(s) are Thing 1 and Thing 2! Our favorite character is the Cat in the Hat. Every time he sings my 22 month old son dances and claps along. the cat in the hat himself. Nuestras personajes favoritas son Thing 1 y Thing 2. The Cat in the Hat. My son loves him both in the TV show and the book. Our favorite is Thing 1 and Thing 2. We love the classics! Thing 1and Thing 2. Pues claro que el Gato Ensombrerado!!! Favorite is the Cat himself! i like thing 1 and 2! My favorite character would have to be the Cat In The Hat. Although the things are so adorable too! We love the Cat in the Hat! Thing 1 and Thing 2. I love when they pop up to help! well, the cat of course – he’s the best! I love Thing One and Thing Two . Subscribed to receive blog updates and subscriber-only content via email . Mr Cat in the Hat himself! we love the cat in the hat.. thing one and two are pretty awesome too..
Mi favorito personaje es el Gato en el sombrero. Me encanta esta caricatura!!.. Te sigo en facebook: Bella Campos. The Cat in the Hat is our favorite character. Our favorite character is the Cat in the Hat. Our favorite is the cat! The Cat in the Hat is my favorite character!